We stop in at Judge Roy Bean visitor center often and have become friends with the local volunteers. A few weeks ago they shared this video of the canyon flooding after 12 inches of rain fell in and around the area. Makes you appreciate the power of water and the eons of time it takes to carve even a "small" canyon. I have stopped their before to admire the arroyo, but wow! Ms Foster who staffs the Visitor Center said she has never seen it flood like that and she has lived there all her life just down Hwy 90 a few miles west. Said that they could hear the roar of the water at the center which is at least a mile away. Thanks for posting the still pics for reference. I'm not familiar with this particular spot. I don't make it out frequently enough to become familiar with the volunteers, but I love the stop in Langtry on the trip out. Here is a map. There are signs on HWY 90 in both directions identifying it as "Eagles Nest". EAGLE NEST CREEK. Eagle Nest Creek, also known as Eagle Nest Canyon, rises a mile east of Farm Road 2083 in southern Val Verde County (at 29°53' N, 101°33' W) and runs south for five miles to its mouth on the Rio Grande, a half mile east of Langtry (at 29°49' N, 101°33' W). Eagle Nest Creek sharply dissects massive limestone that underlies flat terrain, forming a deep and winding canyon. The last mile of the streambed passes through the high vertical cliffs of One Mile Canyon. The area soils are generally dark, calcareous stony clays and clay loams and support oaks, junipers, grasses, and mesquites. Eagle Nest Creek was named for a landmark noted by travelers and settlers for over two centuries. It is an inaccessible, but highly visible, limestone cavern located near the top of a 300-foot vertical bluff on the course of the creek and just east of Langtry. At one time eagles nested on the ledge outside the cavern. On April 25, 1875, Lt. John L. Bullis and his Black Seminole scouts fought border Indians at Eagle's Nest Crossing, near the landmark. Three of the scouts won Medals of Honor for saving Bullis's life in the Eagle's Nest battle. In 1882 the Galveston, Harrisburg and San Antonio Railway established a grading camp near the crossing and named it Eagle's Nest. Here's an article with some great pics of the canyon from that same event. Wow. That's nothing short of amazing. There are people looking at that and thinking kayaking and rafting. Funny you mention that. 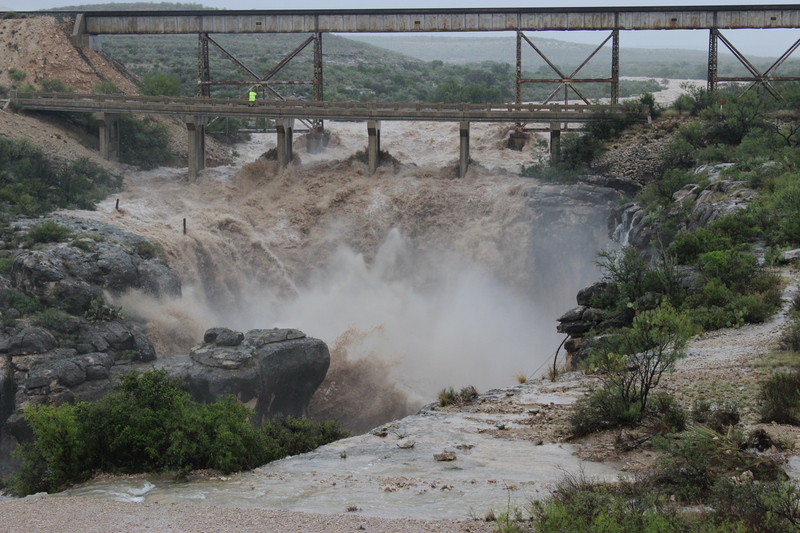 We were down in Terlingua a few days later and witnessed 2 kayakers on Terlingua Creek where HWY 170 crosses by La Kiva. The rapids were impressive!